Small Business Saturday Sale on minky, select kits & stocking stuffers tomorrow! I'm guessing this email is reaching you just as you're ready for an afternoon nap? Maybe you're still recovering from yesterday's turkey induced coma? Or maybe you just returned from an early morning (or all-nighter) Black Friday shopping spree? Or maybe you are reading this while you're still waiting in a long line at a register straining to hold your eyes open? Wherever you may be this Black Friday, we hope you get a chance to rest and continue in the same spirit of gratitude felt yesterday. As you know, we Corn Wagon gals have taken the day off today to do just that. Oh, and to get ready for tomorrow's BIG Small Business Saturday SALE! Small Business Saturday is an opportunity to support local small businesses with your holiday shopping. We hope you'll make the rounds this season to support the unique shops local to you. We look forward to welcoming you tomorrow here at the shop 10 a.m. - 5 p.m. with some great gift bargains for your sewing friends! Whether those sewing friends of yours have been naughty or nice, I bet they would absolutely LOVE one of these reversible pillows! The Little Christmas Pillows pattern by Bareroots includes instructions for making 8 different mini pillows perfect for handmade gift giving. We have a limited number of kits for the wool applique on cotton Naughty or Nice pillow as well as patterns in store! 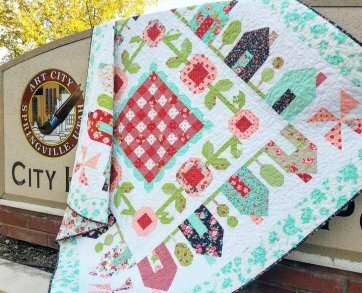 Since we're encouraging you to shop local for the holidays, we thought it appropriate to include the Springville quilt kit by Thimbleblossoms (shown above) in our Small Business Saturday Sale! It will be 30% off tomorrow only! What else will be on special for Small Business Saturday you ask? 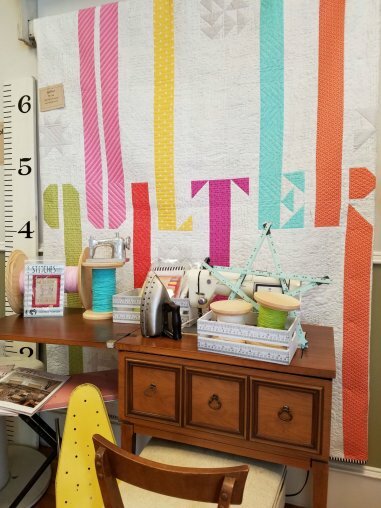 The Quilter quilt kit by Emily Herrick (shown below) will also be 30% off! All Minky and Cuddle fabrics will be 25% off! That includes Cuddle kits and pre-made Cuddle-up blankets! To add a little extra fun to the sale, if you can fit an item in one of our Christmas stockings, it's 25% off! That could be a shiny new pair of Gingher scissors, Aurifil thread, pre-cuts, patterns, any number of notions or even a pair of Moda's quilters socks! If you can stuff it in a stocking it's included in our 25% off stocking stuffer special! Discounts cannot be combined. Holiday Gift Card Coupons are back! Small Business Saturday kicks off our holiday gift card special! Purchase a Corn Wagon gift card valued at $50 or more and receive one coupon for a free yard of fabric! Whether you gift that coupon with the gift card or opt to indeed, "have yourself a merry little Christmas" wink - wink, it's a great deal! One coupon per customer. Offer available in store or you can order over the phone and we will ship to you! Offer valid Sat 11/24 - Sat 12/22. 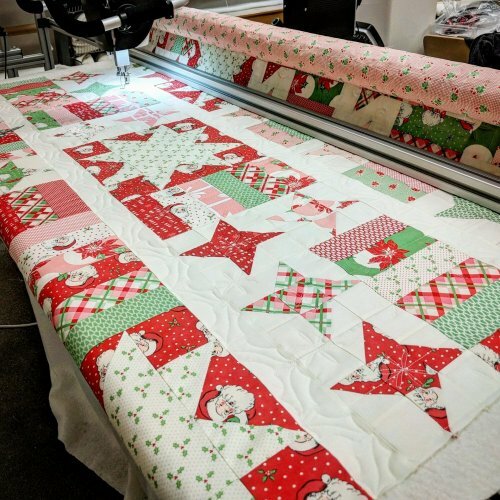 And one more note before I sign off for my nap - - it's not too late to get your quilt tops in for machine quilting before Christmas! Don't wait! There's not much time left but we can still take a few more quilts and guarantee Christmas delivery! Talk with one of our Corn Wagon gals for more details. Don't you love the holly leaf and snowflake details Emily Herrick has quilted into this darling quilt pieced by Shannon White? You really need to see it in person here at the shop! It's now on display and, good news; we have kits for this cutie featuring the Swell Christmas collection by Urban Chiks! Monday, November 26th - 25% off BOOKS & PATTERNS! This weekly club is for anyone who would like to work on a hand stitching project while learning new hand stitching skills. We will learn a-stitch-a-week! This is a great opportunity to finish our own projects and relax with a fun gathering of sewing friends every Tuesday from 10:00am - Noon. Every Wednesday our pre-cut fat quarters are only $2.25! We want all of our “Sew-It-All” friends to join us as we Sew-It-All Weekend! 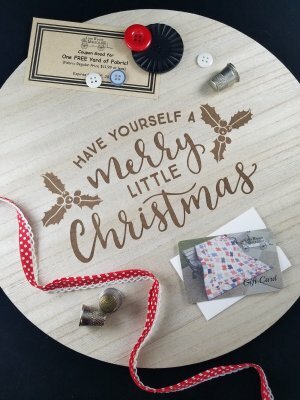 With the holidays fast approaching we want you to ♫ “Sew it all – Sew it all – Sew it all the way!” ♫ Think of this first Sew-It-All event as a Santa’s Workshop where you can bring all your last minute Christmas sewing and, well, SEW-IT-ALL! $65 includes lunch both days so you can sew non-stop at our retreat center. You will also receive a Sew-It-All pass good for exclusive discounts at the shop during the event! Bring any sewing project that needs finishing and Chris & Jen will be there to lend advice and help you trouble shoot. With two whole days dedicated to finishing projects you really can be a Sew-It-All, even during the holidays! Register online! HOLIDAY HOURS at Corn Wagon Quilt Co. The UFO number for November is 6. Thank you for supporting your local brick-and-mortar quilt shop! We feel honored to be part of such a wonderful quilt-making community. at Corn Wagon Quilt Co.
Mon-Fri: 10 a.m. - 6 p.m. Sat 10 a.m. - 5 p.m.